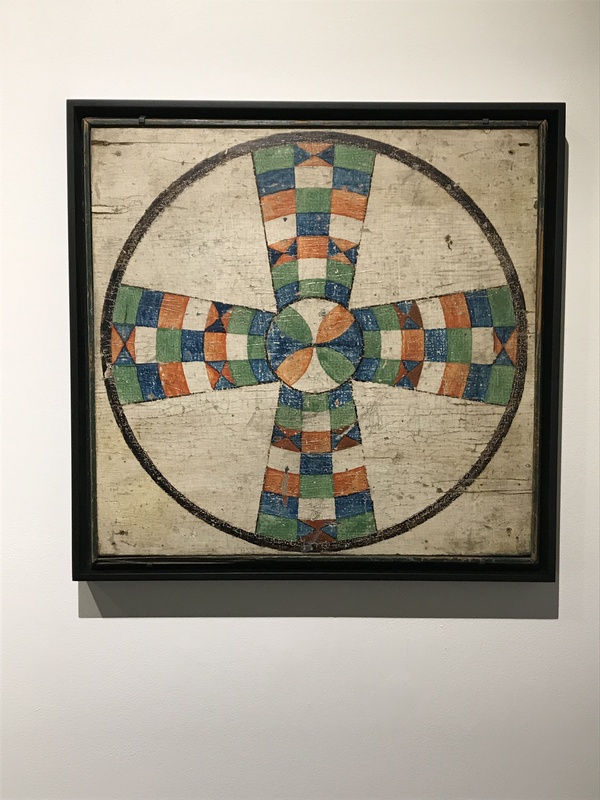 The exhibition “Playing Games: Chance, Skill, and Abstraction” at the Ricco/Maresca gallery presents antique handmade game boards along with contemporary paintings that feature the similar mathematical imagery. Before parlor games were mass-produced artisans hand painted the geometric patterns onto wood boards. This is late 19th century American Anonymous example of a Parcheesi variation board game employs flat color shapes and rotational symmetry comparable to a 20th century abstract painting. George Widener has created work that continues that tradition. “Magic Squares” the mixed media work from 2016 is 16 framed rectangular sheets presented in a 4X4 arrangement. Each one features a number from 1 to 16. The magic is in the arrangement, the numbers in each row, column, and diagonal add up to 34! 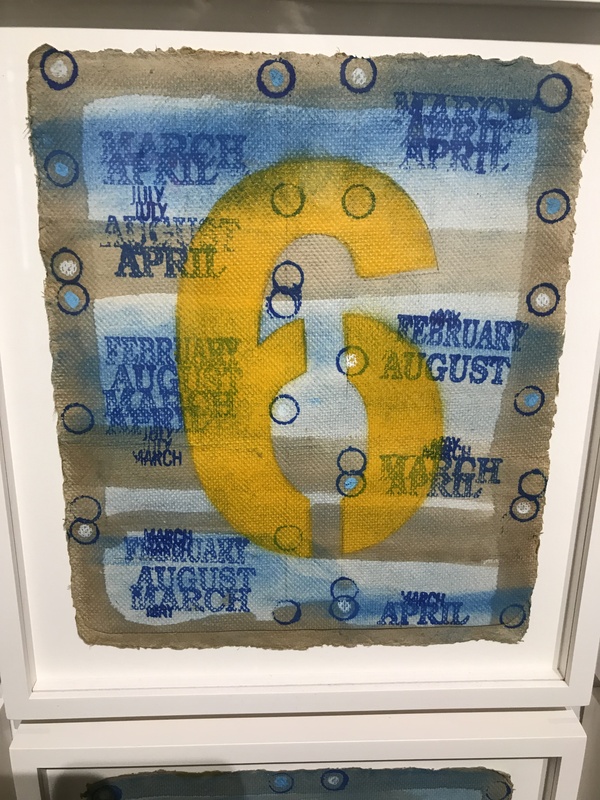 The numbers each have a unique background with circles and a series of text of month stamps. “Diagrams for the imagination” at the Gagosian Gallery on Madison Avenue features work produced by Arakawa between 1965 and 1984. Using words as well as geometric images these works function as schematic drawings for abstract themes. “NO! Says the Volume”” from 1978, prominently displays a dodecahedron in the foreground possibly alluding to the text and title. Above the dodecahedron is a partial ring that is segmented into a black to white gradient from left to right, ending in the unexpected yellow. The use of gray scale is a way to represent a 3-D form with volume on a 2-D plane. 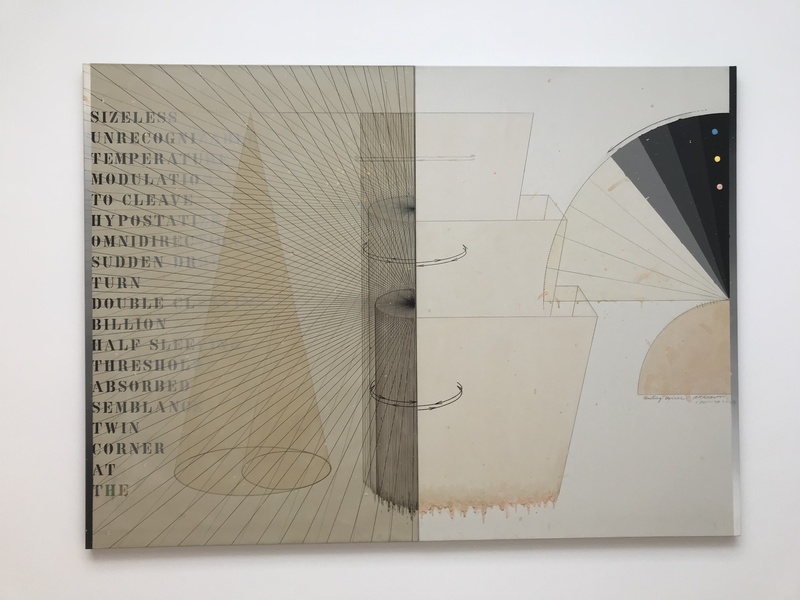 “Waiting Voices” from 1976-1977 is a two panel work. The left hand side has diagram of a cone within a cone and and a partial diagram of a cylinder within a cylinder. The text for this work is all positioned from the left side. 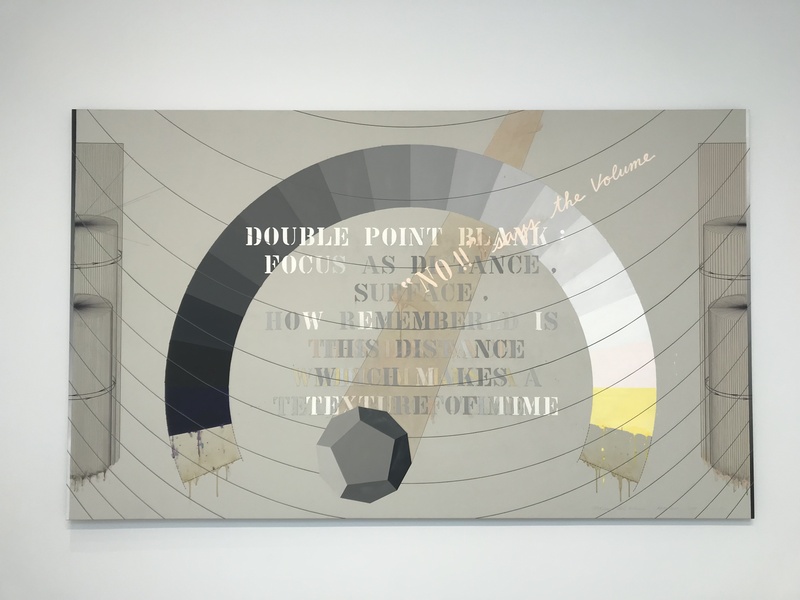 The work in this exhibition incorporates both poetry and mathematical renderings. 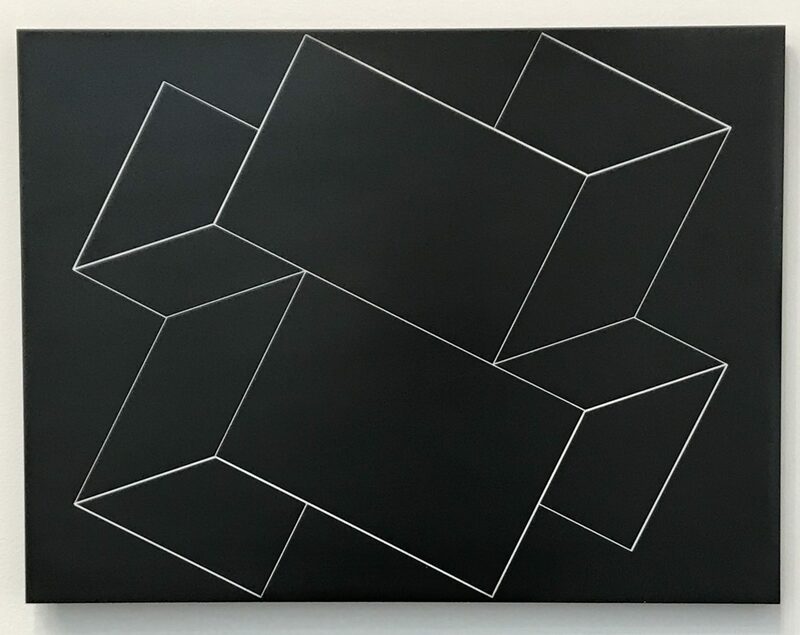 Arakawa creates a connection between the measured accuracy of the geometric figures, imagination and emotion. While the Armory Art Fair is definitely the largest of the March NYC exhibitions, there are a number of smaller but very interesting venues. The Art on Paper Fairs always presents an exciting array of work created on paper. 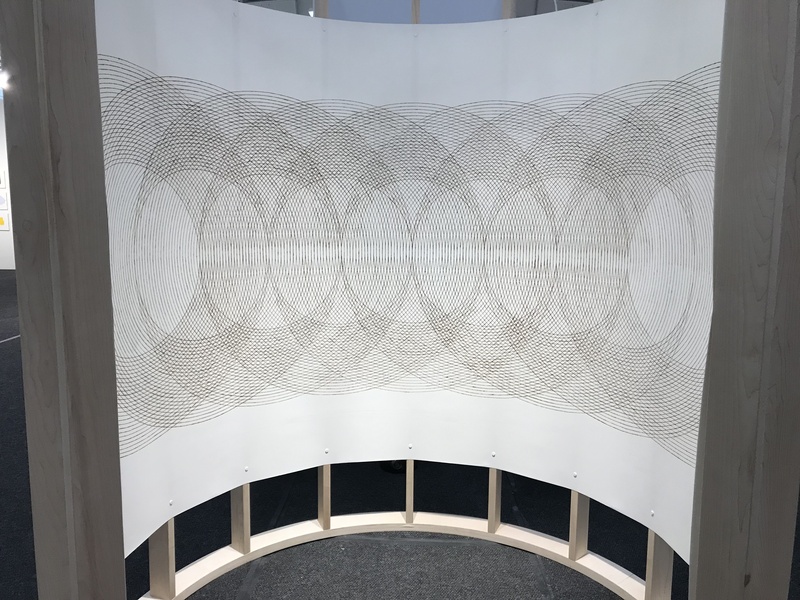 “Shifting Center” by Katrine Hildebrandt-Hussey presented by Uprise Art is a large scale drawing the viewer can actually walk into. This drawing features a horizontal line of circles positioned to have the center point of one circle be on the circumference of the two adjacent circles. Concentric circles are drawn outward from each sometimes overlapping and sometimes obscured. The tubular structure creates the optical illusion that the circles are getting larger nearer the entrance to the space. The NL=US Art gallery from Rotterdam in the Netherlands presented the large pencil drawings of Alexander Roozen. Hand-drawn repetitive mark making processes fill the entire surface are drawn within a mathematical grid structure. Roozen creates very detailed precise geometric renderings of topological spaces while still retaining the subtle texture of the hand work. One of the trends that I have noticed in geometric drawings and paintings is the use of overlapping circles. There were two particularly interesting examples at the Armory Fair. 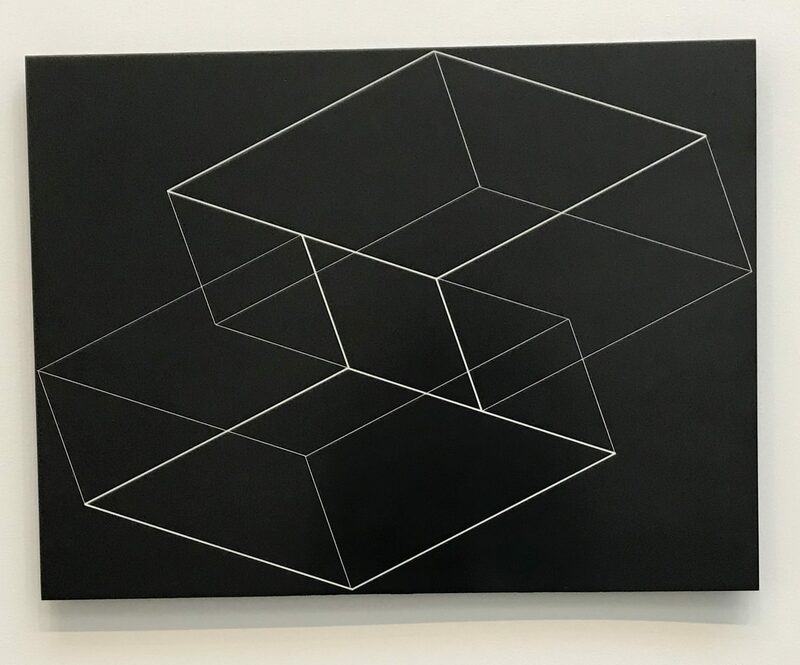 In the Galeria Nara Roesler booth, Julio L Parc’s painting “Alchimie 420” from 2018 was on display. 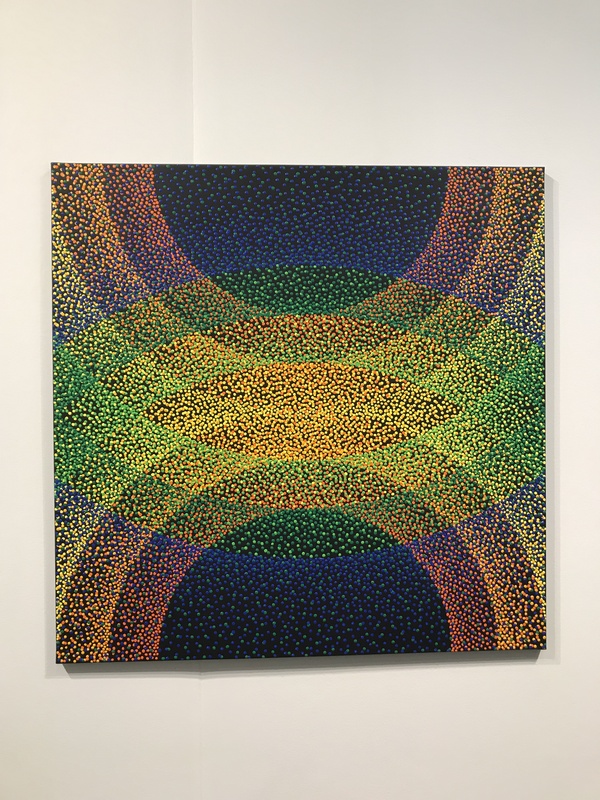 This work offers a pointillistic representation of two half circles with concentric arcs radiating out from the top and bottom of the canvas. As the arcs get larger they overlap at the center and fall of the picture plan on either side. 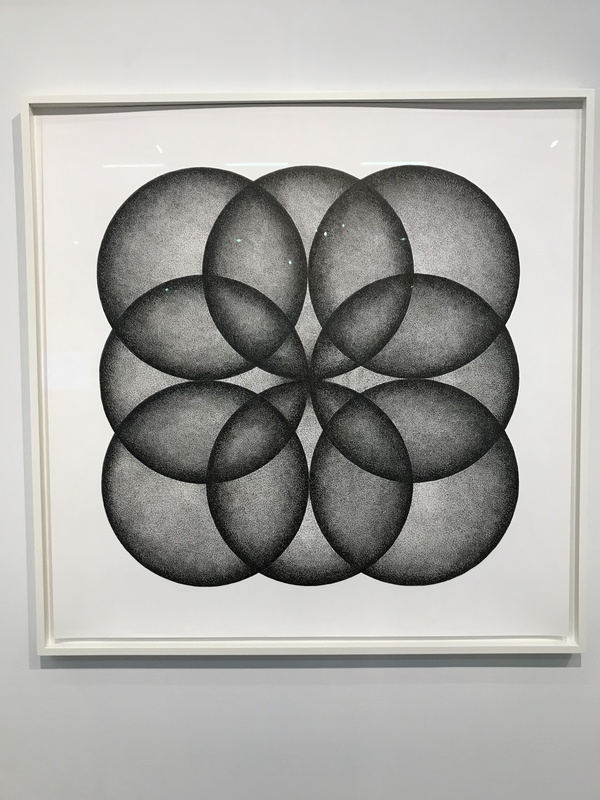 The i8 gallery from Reykjavik Iceland presented Ignacio Uriarte’s 2018 ink on paper “ Eight Circles Form a Square”. 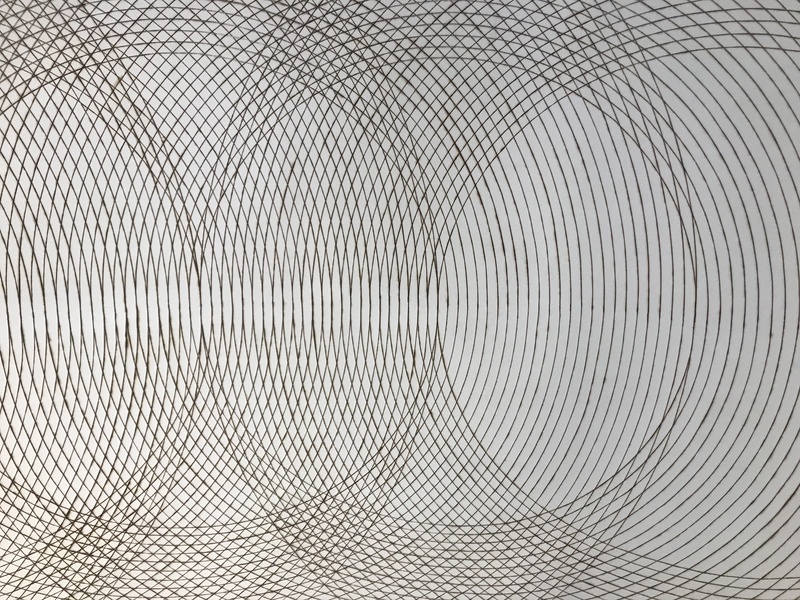 Uriarte’s circles feature a textural shading technique that give them a 3 dimensional presence, but at the same time they appear somewhat transparent because you can see all parts of all 8 circles even they are over lapping. The square structure is formed by two columns of three over lapping circles and over that there is a central column of two non-overlapping circles. There are four sections where three circles and overlap. These giant art fairs can be almost overwhelming. It is almost impossible to see everything. Buy because there is so much art in one place it is exciting to see how different artists deal with similar geometric themes. It is March of n NYC so it is time for the giant art fairs. 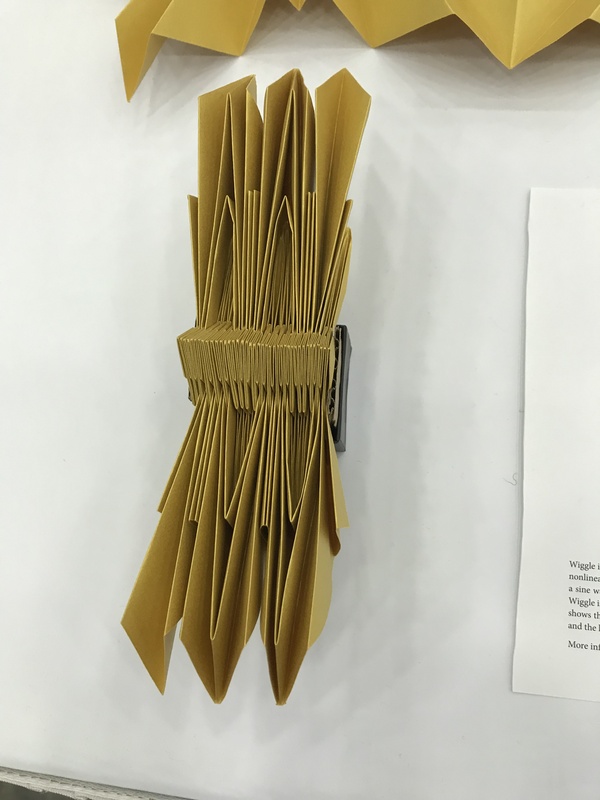 This year at the Armory show on Pier 94 galleries from all over the world brought an exciting assortment of work. 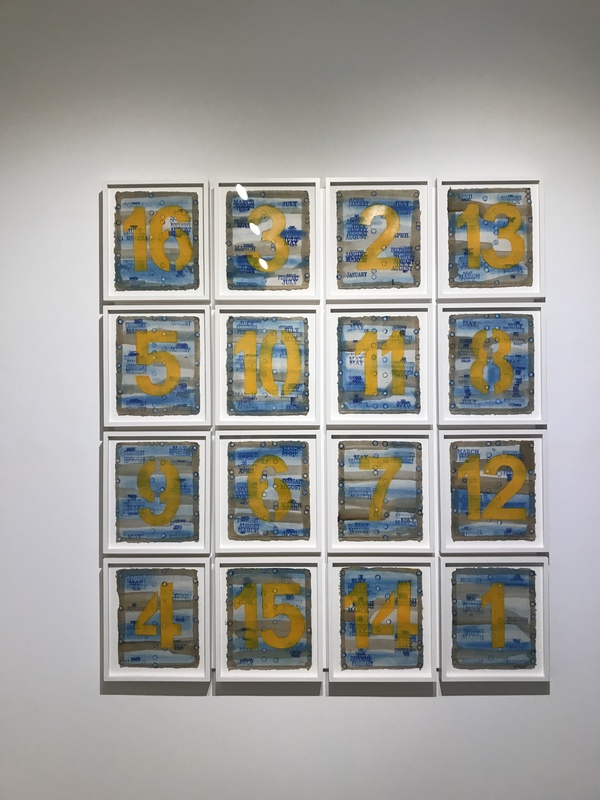 The Proyectosmonclova gallery from Mexico City exhibited the work of two artists whose work have Mathematical implications. 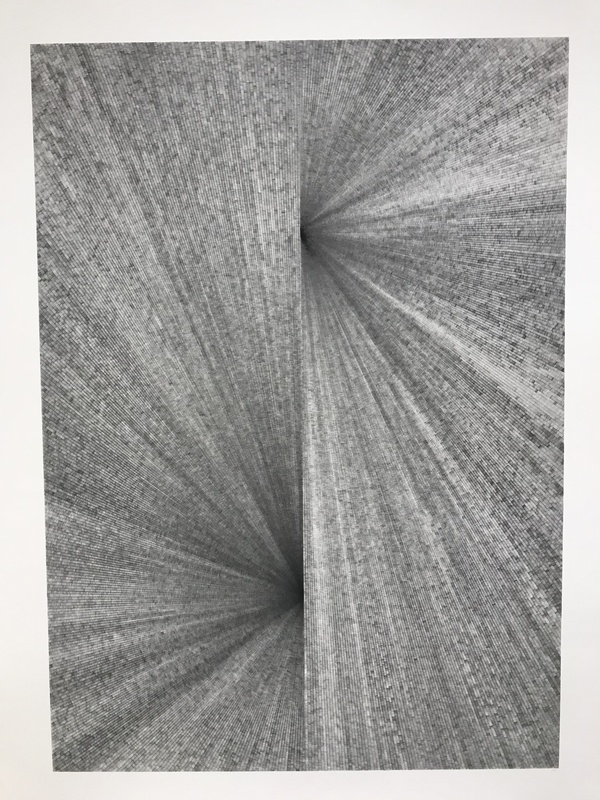 Gabriel de la Mora’s “193,200” from 2019 has two distinct mathematical themes, both geometric and numerical.The use of parallel lines with increasing frequency from top to bottom creates an electrifying pulse of geometric forms. The three rectangular horizontal rows explore the idea of positive and negative space. This work was created using 7;728 used sides from 3,864 match boxes from 193,200 burnt matches. The act of counting each of these elements expresses the intensity and detail in De la Mora’s artistic practice. Eduardo Terrazas creates geometric forms using wool yarn on wood boards for the series “ Possibilities of a Structure” from 2018. 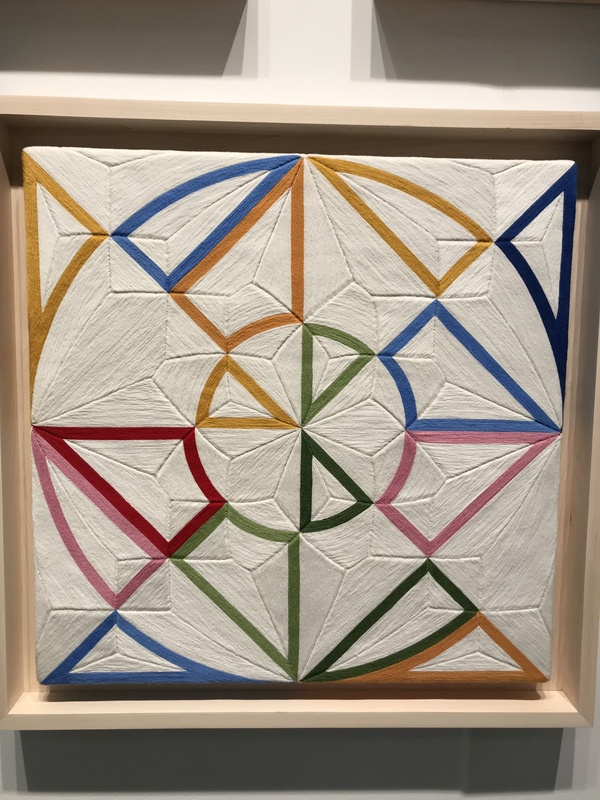 Each of these works have an underlying stitch pattern featuring order 4 rotational symmetry and a circle inscribed within the square structure of the board. The symmetry is broken by highlighting some of the geometric forms with colored thread. Each shape possesses one curvilinear side. The concept of a non symmetrical pattern with a symmetrical framework offers a refreshing way to look at geometry. I have been busy working on new series of limited edition Artist books with Purgatory Pie Press titled “Cartesian Lace Bricolage”. 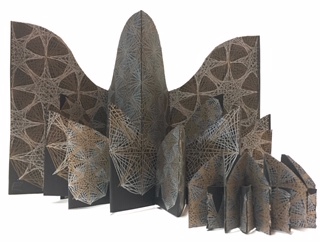 The five sculptural books will feature letterpress prints of my Cartesian Lace drawings in two size scales and a variety of overlapping configurations. The construction of these pieces incorporates a new syncopated intertwined double accordion structure that I have been developing over the past year. We will have this new work on display at the Booklyn Artist’s Book Fair in Manhattan next weekend. You can find the location and opening hours of the fair here. 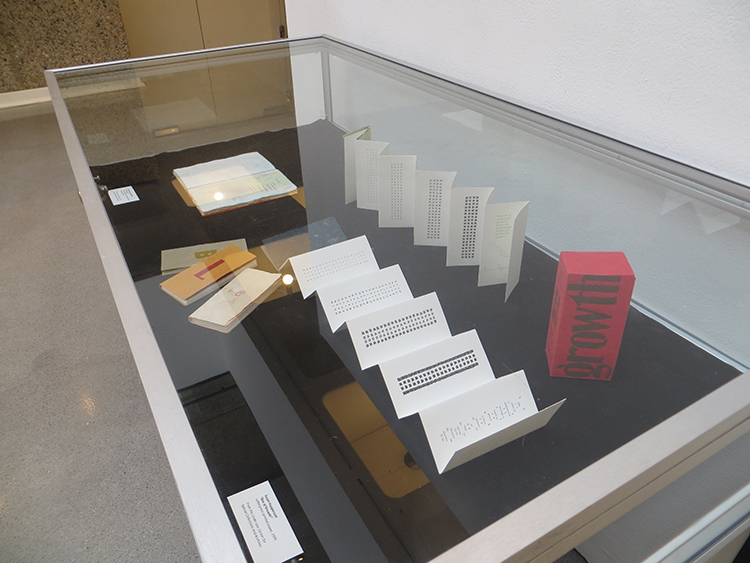 I am happy to report that the “Box of Growth” set of artist’s books published by Purgatory Pie Press in 1999 is on display at Connecticut College’s exhibition “Loose Leafs and Bindings: Book Arts and Prints”. This set of five small books feature my counted marking drawings that illustrate Fibonacci Sequence growth patterns. Installed in the backroom at the Odetta gallery in Brooklyn. I found two cement Fibonacci Numbers from Patrick Gallagher and Chris Klapper’s “Exploring the Poetry of Numbers” series. This number is F96, the 96th number in the Fibonacci Sequence. The Odetta Gallery in Brooklyn is currently presenting a group show titled “Falling into Space”. It explores how physical forces affect the position of objects the artists each utilized a distinct geometric language. 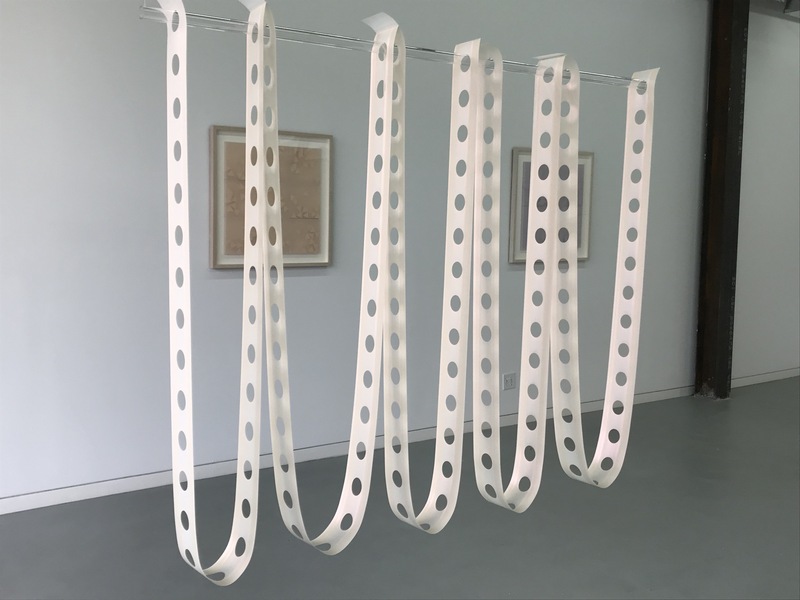 Mary Schiliro’s acrylic painting on Mylar “Cat’s Cradle 7” from 2006 incorporates two columns of circular cutouts. The vertical line of reflection symmetry resulting from the cutouts is subverted by the fluid veil of blue transparent paint. Schiliro’s installment “Disembody” from 2017 continues the theme of a straight line of circular cutouts. The long Mylar ribbon is presented in loops hung from a plexiglass rod running through the center of the gallery. The forces of gravity creating the undulating curtain. The cutaways lined up to create a series of voids illustrating the concept of positive and negative space. 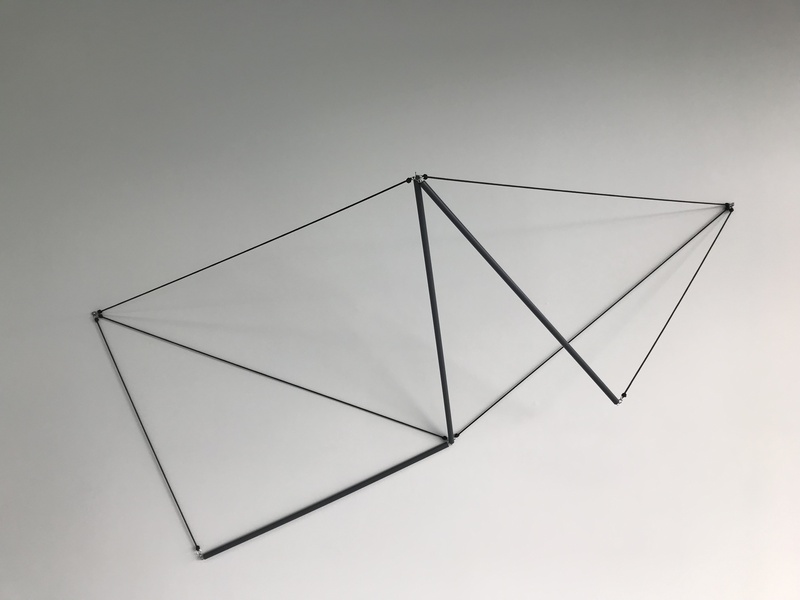 Daniel G Hill’s wire frame wall drawing “Dishtowel Fold” from 2018 is a construction using straight lines to present the basic outline and folds of a form effected by gravity. The two ends are isosceles right triangles. The left hand triangle flush against the wall and the right hand triangle falling forward off the plane. All of the work in “Falling into Place” involves each artists’ geometric processes in a very personal way. The viewer can move through the gallery and interact with each piece on a very human level. 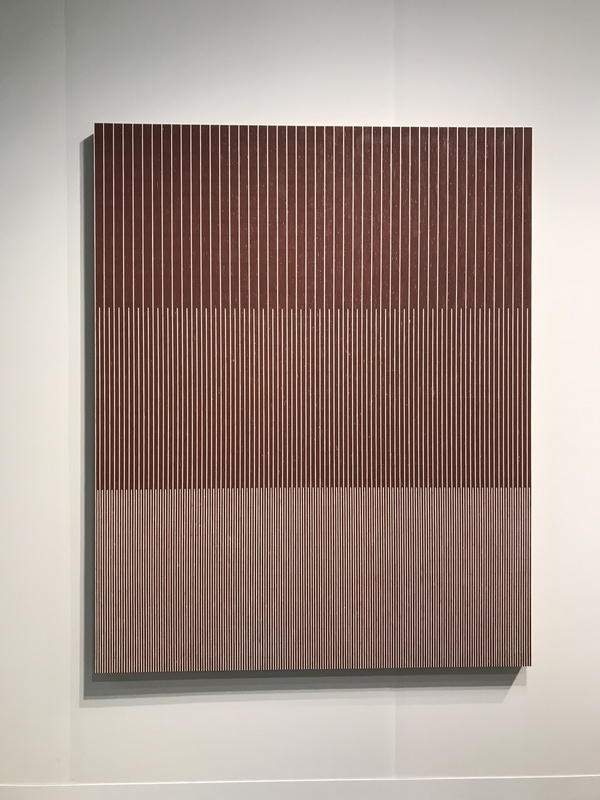 The David Zwirner gallery is presenting “Sonic Albers” an exhibition related to Alber’s interests in music and sonic phenomena. Albers is known for his his investigations into color and geometric forms. His series of paintings “Homage to the Square” produced between 1950-1976 are an iconic contribution to the lexicon of 20th century Art. This current solo exhibition includes some work almost devoid of color, only using black and white. “Structural Constellation M-9” from1954 is a line drawing created using machine-engraved plastic laminate that references the outlines of geometric solids in 3-D space. Two rectangular cubes share a segment of one side. The central figure is a rhombus depicting the shared section. It seems as though the two solids are sliding against each other on the same plane. 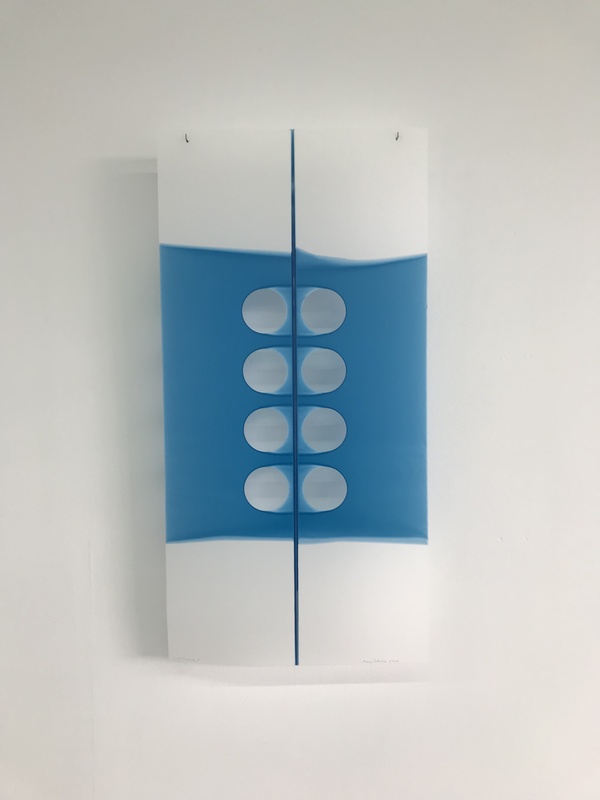 Here is another panel from the “Structural Constellation” series instead of featuring closed geometric solids this work depicts open forms that share edges in what looks like a precarious arrangement. Here are two more great selections from the Art Exhibition at JMM. 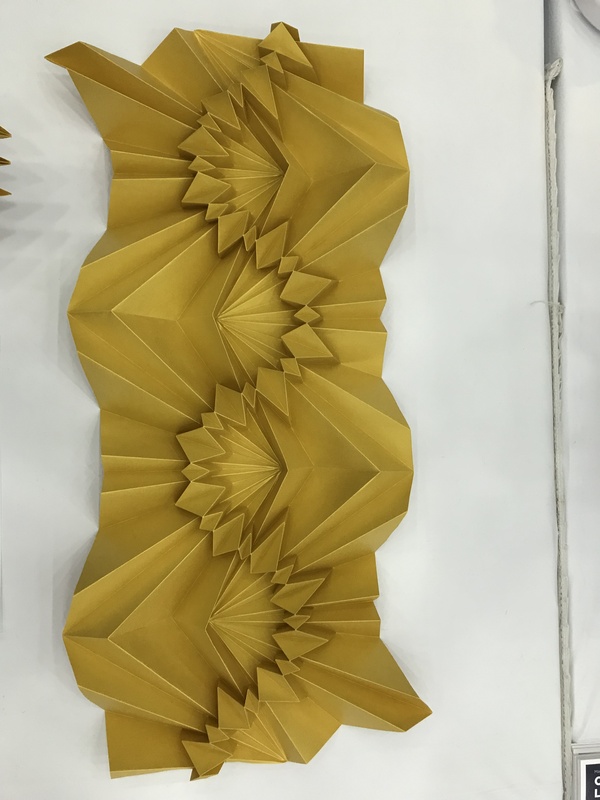 Uyen Nguyen creates computer generated origami. Using precise Mathematical calculations, “Wiggle” presents a raised modeling of a non-linear curve. It can be folded up accordion style into a compact pattern. 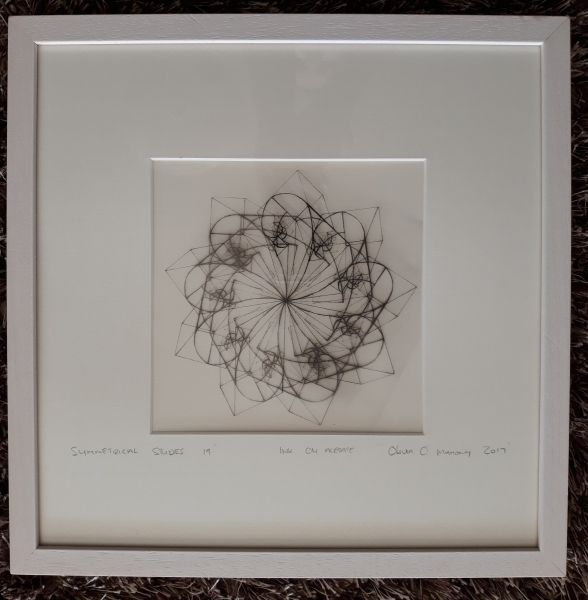 “Symmetrical Studies 19” an Ink on acetate drawing by Olivia Bridget O’Mahoney has an interesting order 9 rotational symmetry. The artist incorporates both a curvilinear wave type of illustration as well as a straight edge cubic rendering. O’Mahoney states that this piece was inspired by the work of both Leonardo Da Vinci and Stephen Hawking.